Of course I only discover the giant bear on the last day it will be standing here. I might just go back and see if they (whoever they may be) have changed their minds and the bear will not go into hibernation during winter. Quite like the idea of a bear covered in snow (assuming we get snow this winter). 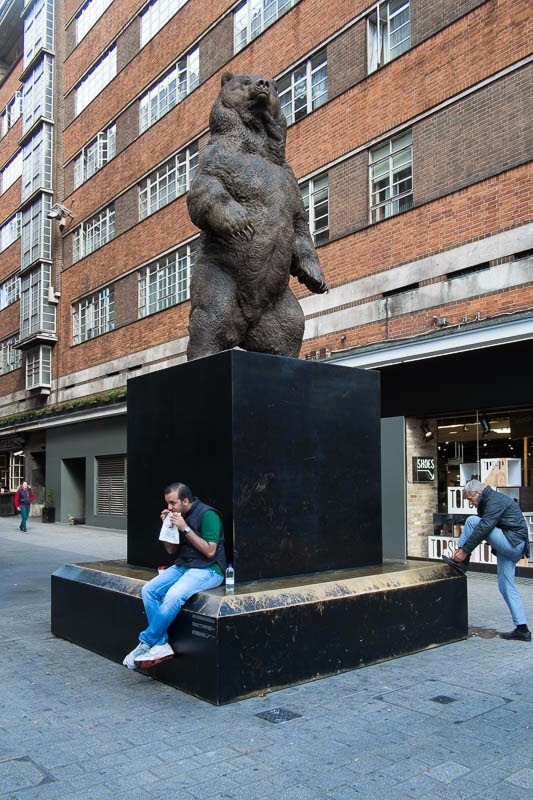 He is (or was) standing on the corner of Oxford St and Quebec St a sculpture created by artist Nick Bibby. Nice place to tie your shoes. Hope there were no bears flying over - looking for a mate. Sorry: I have a plastic kestrel hanging in the garden to keep the cats away - and each year a few real ones touch down to investigate. Oh dear...the way my mind works is embarrassing. This bear looks like he means business. There are so many interesting thing in London. I look forward to being there next week. He is a magnificent looking creature standing up there! Too bad he is not a permanent fixture. Quite a sculpture, and having the people in the shot really gives it scale. I wouldn't have known there was a Quebec Street in London. Nice sculpture and interesting to see the two men in action, plus the size of the sculpture too. He's a beauty! Very realistic but, he hasn't scared off that guy with his lunch. Magnificent. What a shame he isn't there for longer, and like you say when the snow, eventually, comes!